FR plans to continue to open UNIQLO stores in major U.S. cities, expanding its presence in the U.S market to provide consumers with an unparalleled shopping experience and the best in innovative high quality, affordable apparel. /…/ Uniqlo´s mission is to empower all individuals through the clothing they choose to wear. Rather than become characterized by a brand, UNIQLO encourages its customers to integrate its pieces into their own unique style. 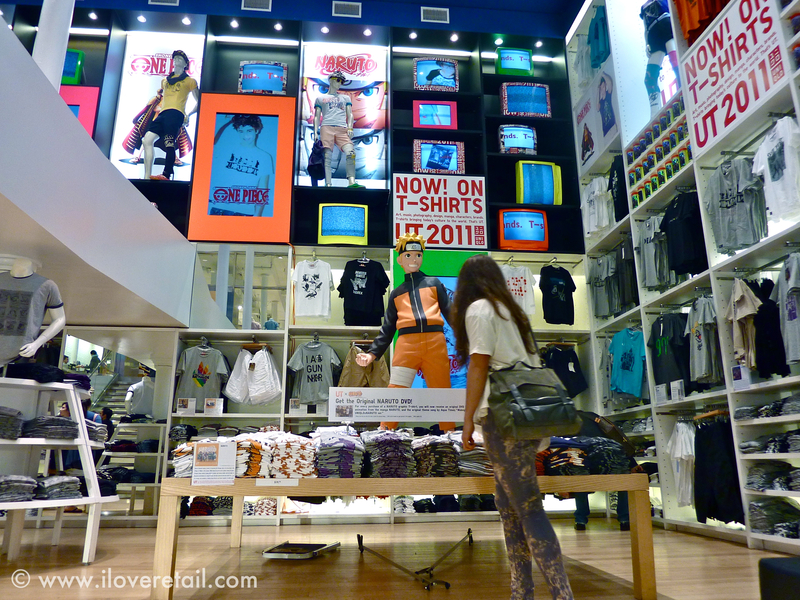 Designed by the retail miracle worker Masamishi Katayama, head at Tokyo based WonderWall it is little wonder that Uniqlo U.S spaces stand out from the flagship mainstream. Large quantities of goods in large variety of colours are neatly stacked along the high raised walls. The neat organization provide a calming repetition and a visually soothing backdrop to Tokyoesque intensity in avantgarde elements such as the revolving t-shirt display, manga animations and flickering TV-screens. The Uniqlo stores has generated lots of engagement online sphere with over 800 reviews on Yelp.com and a mean grade of 4/5 (in comparison to the 5th Avenue Apple store with a humble review count just over 300 with same average score). Large black textile shopping bags open up for serious bulk buying and are quickly provided to customers by casually uniformed staff as clothes pile up on your arm…Store employees are accommodating without ever being sticky and I witnessed high quality floor problem solving on various occasions in the store. As the speed is high paced, quick and umprompted employee action is often needed. This experience might echo the fact that employees are trained in a corporate program called the FR Way– “Changing clothes. Changing conventional wisdom. Change the world.” FR calls this program a “unique and specialized training program ensures the same quality of service and shopping experience in all stores and teaches all employees to think globally while putting the customer first”. I kind of like the idea of changing conventional wisdom. The “Wearable Sunscreen” collection (with campaign starring Hollywood star and South Africa native Charlize Theron) seems like an extension of this notion into the retail philosophy. 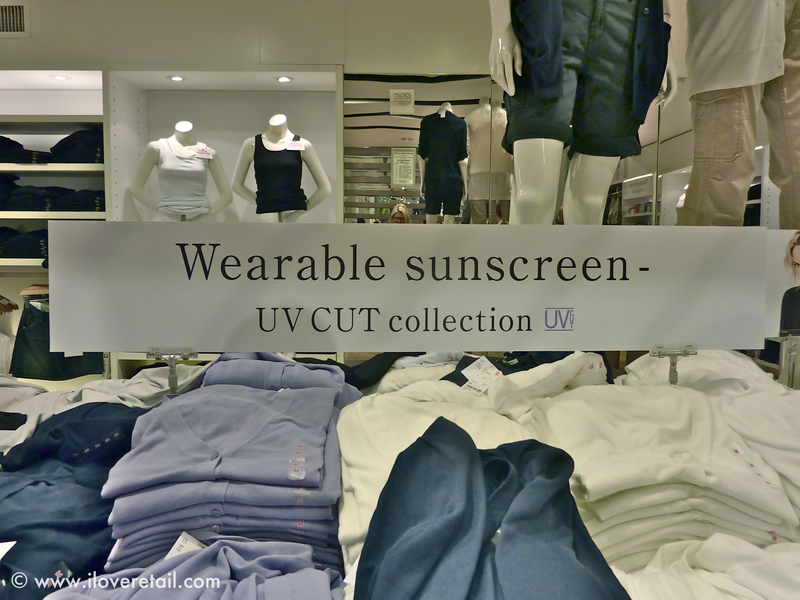 It could be regarded as conventional wisdom that all clothes are in fact Wearable Sunscreen, yet Uniqlo creatively twists the concept and launches it at innovative and uniquely Uniqlo. Also, the brand has launched collaborations such as +J with fashion house Jil Sander and also for more street cred, the Designers Invitation Project featuring among others designer Charlotte Ronson (with famous sibings music producer Marc Ronson and DJ Samantha Ronson). 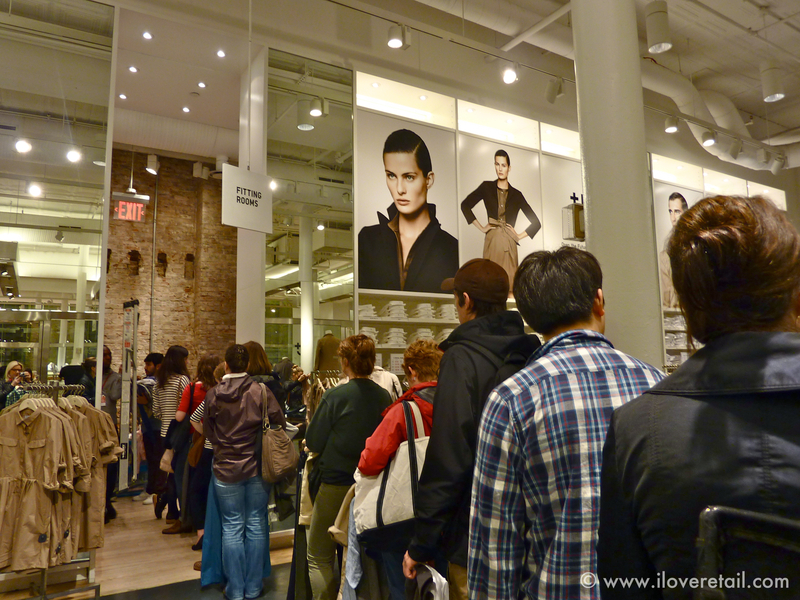 During rush hour, the queues to fitting rooms may seem neverending. Although a potential source of irritation, they are ultimately a sign of success. Customers would not wait if the reward was not considered potentially great. Furthermore, as visits to a flagship like this one tends to be one-offs during shopping holidays, the waiting line is not experienced as a recurrent problem. Summing the U.S Uniqlo is best described as being crisp. However, in order to remain so, new energy must eventually be injected in to the Soho space soon, as the decor has remained unchanged since 2006. It will be very exciting to see what the new venues will bring – the new flagship will be the 5th Avenue store which will be 2,5 times bigger than the Soho store! 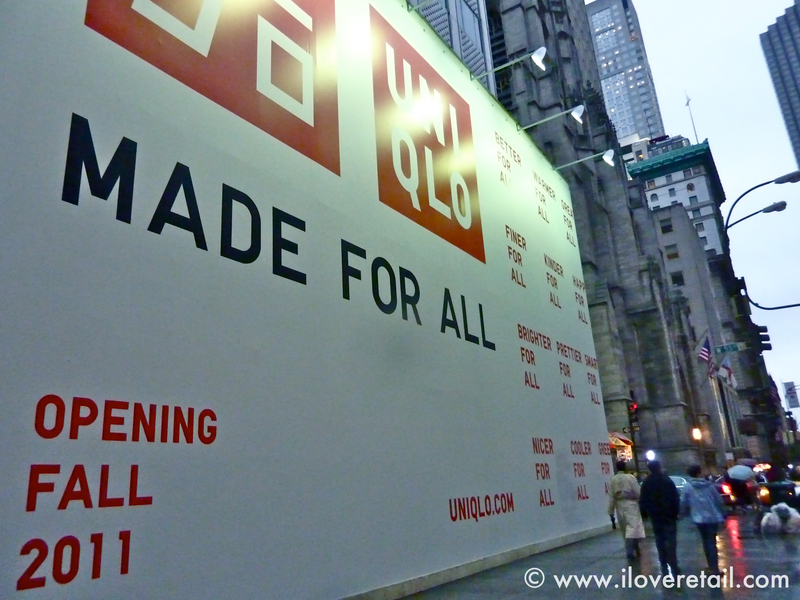 As the expansion continues, I am certain Uniqlo will grow out of the notion of being “Japanese H&M” and into being simply and uniquely Uniqlo – and that´s not too bad either. 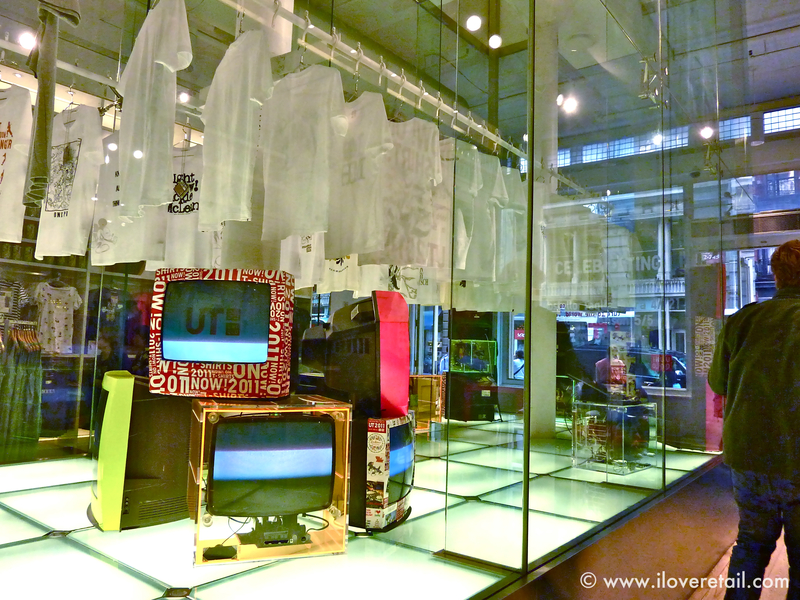 Prices are low, yet Uniqlo gets high scores for innovation, shopping experience and service. All -in-all the Uniqlo recipe smells like great retail potential. iloveretail.com is meant to be an inspirational melting pot of snapshots and reflections on retail concepts, retail environments and retail experiences in New York, Paris, London, Copenhagen and Stockholm.